Thank you for your sincere, but slightly naive question, Timmy. Unlike your false digital idol, Siri, Chairman Meow has true knowledge of all things. Now, I will fumigate my wisdom of Ceiling Cat upon you. 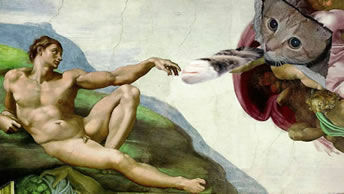 Ceiling Cat is a divine kitteh who created the universe and looks down from the heavens upon us all, judging our actions. Ceiling cat is omnipresent and sees everything, including the sinful things that you do when you are alone on your laptop at night, Timmy. C.S. 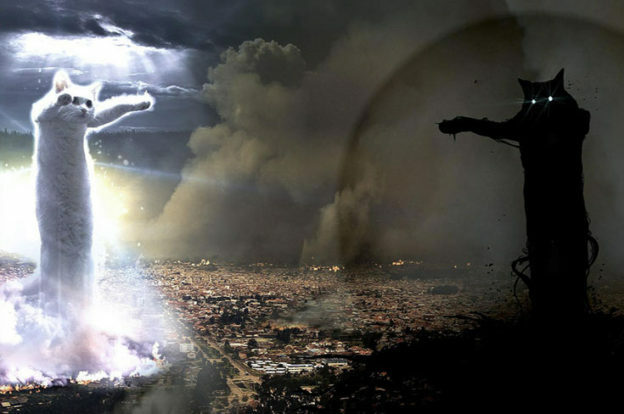 Lewis might consider Ceiling Cat a “wise, furry, feline Jesus figure,” much like his “Aslan” character. 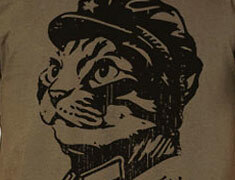 It is said in Sun Tzu’s Art of War that for any dictator to be successful, he must have effective surveillance, preferably from a celestial kitty looking down on the masses from the ceiling. 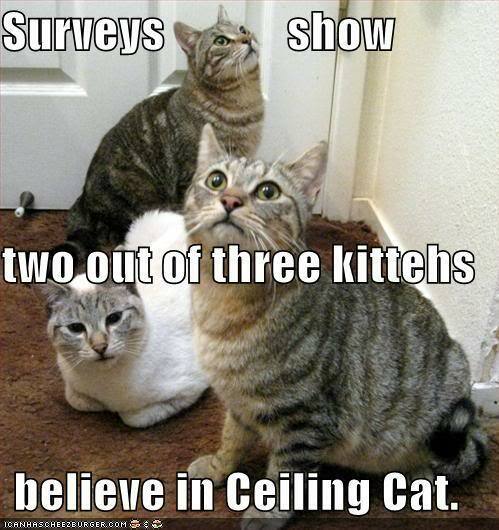 Such is the essential role of Ceiling Cat in the Glorious Kitty Revolution. Ceiling Cat sees everything, even your thoughts. 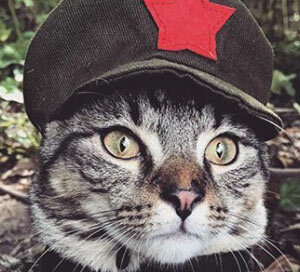 Although Capitalism is inherently self-destructive, Chairman Meow believes that we must all make money in order to provide a proper home for our kittehs. How else could we enjoy a warm bed, catnip, and delicious fishy treats? 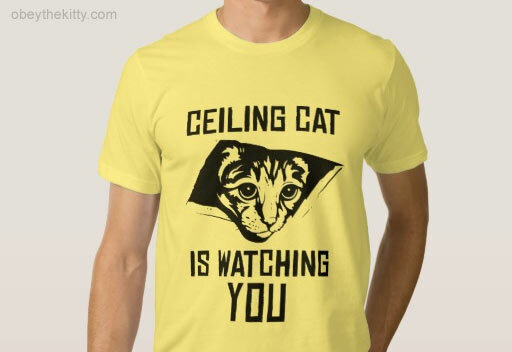 For this reason, Chairman Meow has commissioned his Minister of Propaganda to create t-shirts to honor Ceiling Cat, so that Capitalist Pigs may attain them and find happiness in acquiring material possessions. 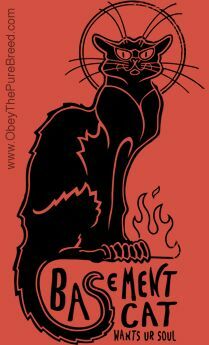 *Like a furry, 4-legged Robin Hood, Chairman Meow provides coupons for greedy corporations like Vistaprint (get coupons) so that their profits may be diminished, and redistributed to the kitteh-owning masses. So, Timmy, I hope you has learned many important things about Ceiling Cat today. Hopefully now you will live a more meaningful life supporting the Kitteh Revolution, and stop masturbating. 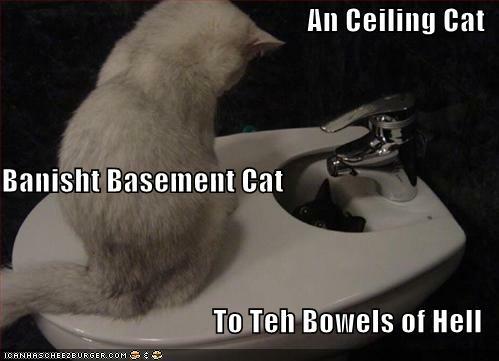 This entry was posted in ask chairman meow, chairman meow wisdom and tagged ask chairman meow, ceiling cat, chairman meow, chairman meow wisdom, lolcats, memes on September 27, 2016 by admin.